Imagine you and a stranger find yourselves trapped in an elevator and by some stroke of fate both your mobile devices are stone dead. Imagine you’ve already used the elevator’s emergency phone to report your plight, but the guy on the other end says everyone down in Maintenance is off celebrating the birthday of this other guy’s 30 years of service. They’ll get to your problem in an hour, he says, two tops . Then let’s further set the stage by assuming that the two of you share a common language and that neither one of you has to go to the bathroom. Thus, on these two fronts at least, you can relax and really inhabit this little soap bubble of time in which you find yourselves floating. Now the question is, not what you’re going to DO, as this list drawn up by the funny people at The Onion, but rather what are you going to talk about? You know what you’ve been taught NOT to talk about: the forbidden trinity of religion, money, and politics. Stay away from all three subjects in polite company, you have always been told, but you can’t just look over the person’s head like people do on the subway. That would just be weird. Soooo, what subjects could you turn to pass the time? Well, people turn to the topic of their kids pretty quickly, so maybe you could start down that avenue, sharing information about their ages and so on. There would be no turning to your dead phones to get at photos of course, but that’s ok: you could paint a picture with language, old-fashioned concept as that is. So I guess you have to be careful choosing your topics. Here’s an idea: People love explaining their scars, I’ve noticed, though this might not be the right setting for that particular show-and-tell. Ailments also make a reliable topic but they too might be dicey in this context, especially if your elevator-mate has been on earth long enough to have a nice long medical history. I mean, you might never get your own turn to talk! The weather’s a pretty tired topic and sure there’s sports but what are the chances you’re both fans? Television. You’ll never go wrong with TV shows. I don’t care if you’re Cleopatra the Queen of the Nile, you watch TV. Even if your tastes differ as to genre – I, for example find sitcoms almost unwatchable these days what with all the wink-wink of sexual innuendo – I bet within two or three minutes you’ll find common ground. And then you won’t even realize that the guys down in Maintenance have moved on from eating cake to doing shots. You have another human being and the chance to talk and talk, and really, what’s nicer than that? Talk about Antiques Roadshow or Turner Classic Movies. 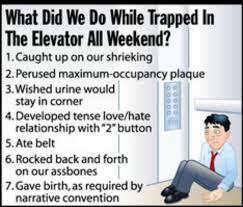 I was trapped on an elevator once, and luckily, the other passenger was my daughter. Also luckily, we had just been to the package store…We were rescued much too soon. haha Joan – love it! Instant party ! I learned early on that cannibalism is not a good topic to broach in close, entrapped spaces, especially after 6 PM. Just something to keep in mind….